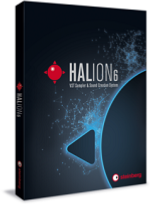 HALion is the most comprehensive virtual sampling and sound design system available today. It covers creative workflow from recording and sample editing to programming advanced synthesis and modulation setups. With HALion you can create customized user interfaces and export ready-to-release instrument libraries. The powerful set of oscillators for seamless sample playback as well as the next-generation synthesis make HALion a versatile creative tool in simply every situation. Its library includes thousands of high-class and deep-sampled instruments and cutting-edge synthesizer sounds for all kinds of musical genres.